The LubISS project aims to explore the expansive potential of lubricant impregnated surfaces, focusing on three applications of high societal, environmental, industrial and medical impact: Anti-icing, easy-to-clean and anti-fouling. 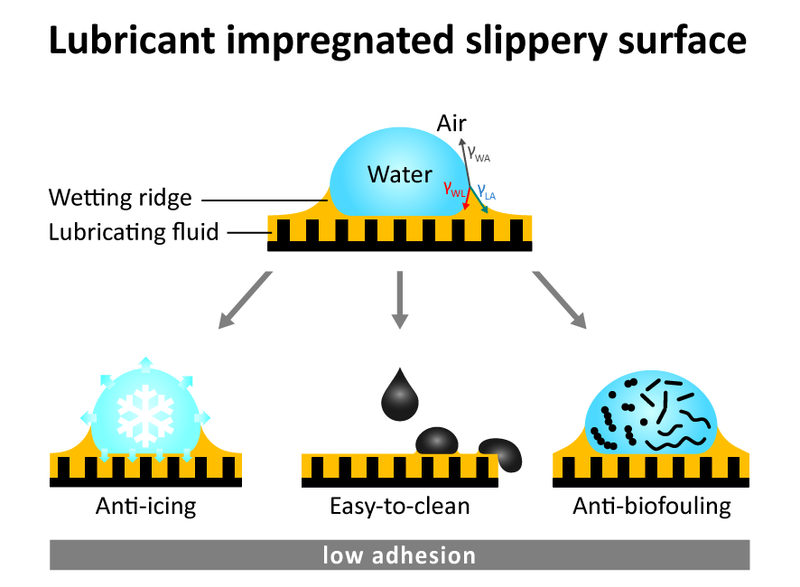 Characteristic for lubricant impregnated slippery surfaces (LubISS) is that the textured or porous surface is impregnated by a liquid or a gel. The mobility of the lubricating film greatly reduces the (lateral) adhesion. Deposited liquid or solid particles, bacteria or other microorganisms can slide off easily as soon as the surface is tilted by a few degrees. However, LubISS face the problem of limited durability, the lubricant needs to be replenished after some time. To develop durable and environmentally friendly LubISS, the understanding of the interplay, and the physical- and chemical interactions between the solid surface topography, the lubricating film and the liquid (liquid and solid particles, bacteria, etc.) under static and flow conditions is necessary. The LubISS network aims to provide this understanding and will make use of it to design durable LubISS. Their performance will be tested under indoor and outdoor conditions. A distinctive feature of LubISS is that droplets of nearly any liquid slide off these surfaces very easily. This water drop began to move when the substrate was tilted by less than 2°. At a macroscopic scale the drop shape resembled a spherical cap. However, a closer look at the drop–lubricant–solid interface revealed that the contact angle of the drop with the substrate exceeds 140°.